It would be wrong to believe the picosecond laser is superior to the nanosecond laser in dermatologic conditions. However, it does have excellent efficacy in enlarged pores and acne scars as it effectively removes perifollicular fibrosis. As the picosecond laser is leading the trends of aesthetic medicine, having the device can help market one’s practice. 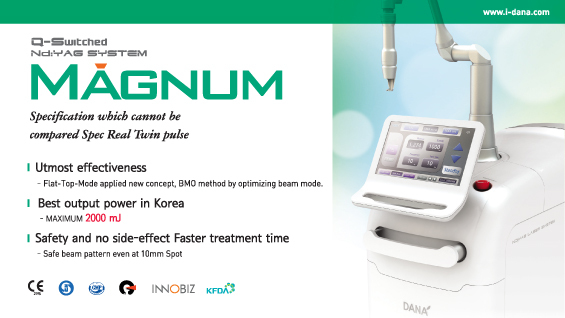 When will the true picosecond laser be available? The current technology cannot yet produce a pulse duration below 200ps. However, even if this became possible, one problem remains. With a very short pulse duration, a plasma that is supposed to form in the tissues forms in air, which can damage the epidermis and cause side effects. As the plasma can form right at the tip of the handpiece, it is important to develop a way to prevent gas plasma. With the current technology available, I think the picosecond lasers being released will aspire to the picosecond domain, rather than be true picosecond lasers. I am expecting that a laser with the pulse duration in the 300ps range will be released in about a year. Wavelengths of 532nm and 1064nm will be best matched with 375ps and 450ps, respectively. We have talked about the common misunderstandings that many doctors and industry personnel have about the picosecond laser. I am afraid that my commentary may come across as negative but I believe my honest review of this new device will help other users. I do agree with the opinion that the picosecond laser will eventually lead the aesthetic market if the manufacturers keep making improvements that sets it apart from the nanosecond laser.